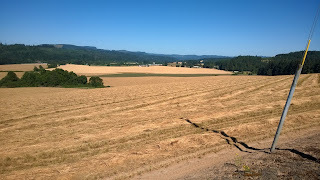 “For amber waves of grain.” Katherine Lee Bates of Massachusetts wrote this phrase years ago on a visit to Colorado. 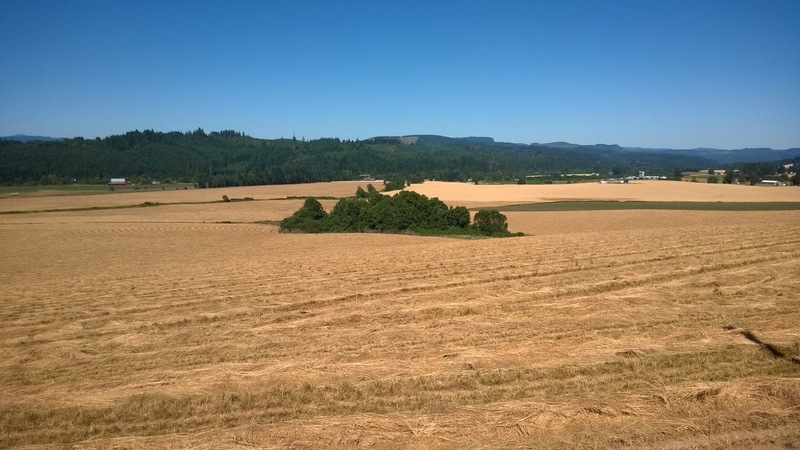 This week, I found this sea of grain in Oregon. The sight is so typical of the U.S.A. 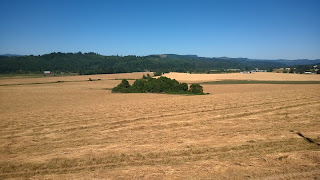 The grain is amber right now, in early July, in the upper Tualatin Valley, located west of Portland. In the background you're seeing the hills and mountains of the mighty Coast Range. The shining sea begins beyond the Coast Range, about forty miles away to the west. Bates, a professor at Wellesley College, located near Boston, lived for over two decades with Katharine Coman, an economics professor. Bates proclaimed her love for Katharine in a book of poetry. “I think ‘brotherhood’ works if understood as a community of all people, not just men,” she could say. But I'd really like to hear her say it. The phrase“with liberty and justice for all” isn't found in “America, the Beautiful,” but those five words from the Pledge of Allegiance help me to understand the spirit of the song. Francis Bellamy, Baptist pastor and the author of the Pledge, knew that the words applied to the Republic for which the flag stands. His phrase, “liberty and justice for all,” describes the enduring and highest values of the USA as well as any short phrase. Citizens and residents of democratic nations exist, really, day to day in smaller communities. These communities--families, schools, shops and offices--create common understandings, or cultures. Think of your small community or your neighborhood. These cultures feed into nationhood. The nation feeds back those values. It's in the community that the roots of democracy are nourished. I suggest that we give attention to ducks, especially to the females and ducklings. 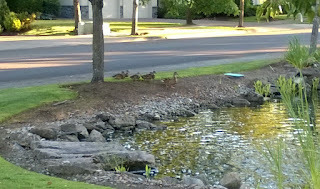 The ducks are mothering their broods just now, as summer arrives. The “kids” learn lessons from the mother duck-- how to swim, find food, and to get her protection by staying close. 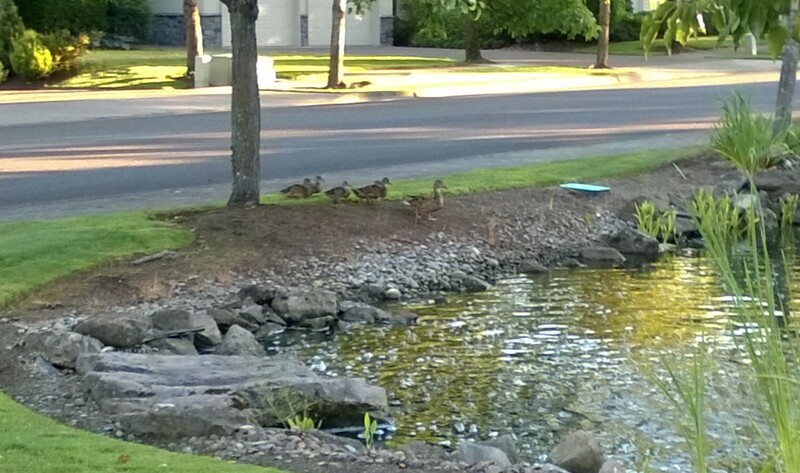 When she sees a threat, she quacks “Come quick”, and they scoot on as a group. If one falls behind, she goes back to urge it on. Ultimately, after a few weeks, she gets them airborne and they fly with bigger flocks. What the ducklings become is what they already are: they just have to mature into the fullness of their being. Our communities are like duck families in a way, but as human beings we're more flexible, variable and inventive than ducklings. We need even more protection than ducklings and much more nurturing. Our greatness can be reached more fully as we embody values of brotherhood, liberty, and justice for all. I can hear Katherine Lee Bates and Francis Bellamy cheering us on: “Yes! Parents, teachers, leaders: go for it! Kids! Learn your history, recite your pledge, develop your faith! Own your destiny!" ". . .God mend thy every flaw." No matter what nation you live in, you can surely list its flaws. I have my own list. How do we reconcile the flaws with the higher values we honor on our national day? A final thought about that question. The Pledge ends this way: "one nation. . .under God. . .liberty and justice for all." I always go on to think these words: ". . .so help me, God.” I consider the best and highest of national values to be spiritual, a calling to us all to achieve a higher greatness. 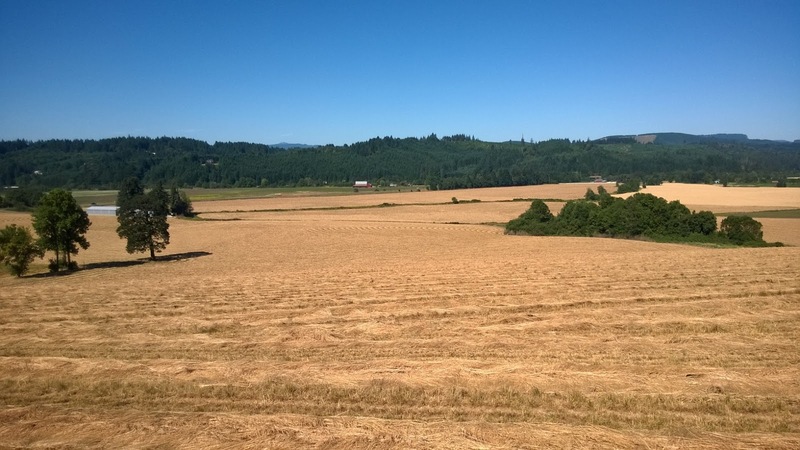 It takes time and cultivation for ducks to fly in flocks and months for grains to grow into golden waves. We-- individuals, in communities, forming nations--can grow into much higher grades of gold than we've yet achieved, relying on ourselves, called on and cultivated by a Force beyond ourselves. Happy Fourth. Visit www.darrellreeck.com next week for another post.